Take the lukewarm water, buttermilk, yeast,salt, sugar, butter, cardamom powder, banana puree in a large bowl, lightly whisk everything in a large bowl and add gradually the flour without kneading using a wooden spatula,until the flour get well mixed..close the bowl and allow the dough to rise upto two hours in a warm place..Once the dough get rised, arrange the dough in fridge for half an hour, it will be easier to handle the dough.. Grease a regular cake tin with enough butter...Take the dough , dust lightly with flour and roll the dough as a medium sized round shaped loaf, arrange the rolled loaf over the greased cake tin..make some slashes over the dough, cover the dough with a wet towel, allow the dough to rice for an hour again...Bake the bread at 350F for 30-35minutes until the crust turns brown...brush the bread with butter once they came out of the oven.. Enjoy the bread with nutell spread or jams..
wow, no knead sounds great and the bread looks yummy !!! wow..sounds & looks great..liked the combo. 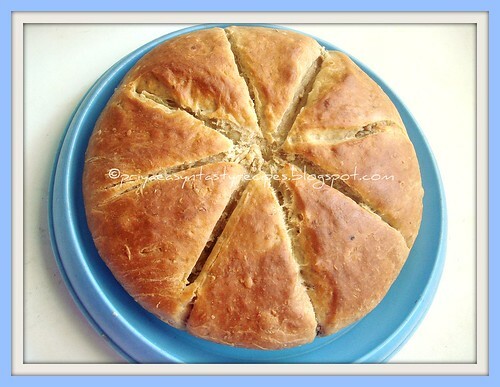 Yummy bread...I love the flavor and aroma of the cardamom seeds and would love to try this bread. Thanks for sharing !! MMM...banana and cardamom? That's got to be a winner! A lovely bread! Looks yummy! I love no- knead breads.The combo is aromatic for sure.Love the crack on the bread! Isso é tudo de bom!!! Deliciosa receita e bela foto do prato. bread looks different.. liked it! Thanks for answering my query Priya! That looks delicious Priya. Very different. What to say Priya! You are an expert baker....bread looks so beautiful and fluffy. wow bread looks so soft n perfect ...love this no knead bread ..
no kneading! there is nothing much easier than this. No knead sounds great! It looks so fluffy! No knead is always good..perfectly baked bread!! Very nice and interesting recipe. Bread looks very soft, yummy and tempting. I have been waiting for my first recipe with yeast.. And have been delaying it for long. While I wondered when the long bought yeast would be put to use, I come across your recipe. I think is it. No knead. Good one for starters. Thanks Priya. wow,banana bread looks perfect and tempting! Yummy looking bread and aromatic as well. Wow perfect breads u've got! mmm this looks interesting. never had something like this before :) i need to try one of these out eh. take cares & have a great day! Looks so spongy ..... Will try this soon. I bookmarked it. So easy and wonderful tasty bread. Thats a nice and hassle free recipe for a bread priya. Surely a must try for me. Sounds good,new kind of recipe to me,thanks for the recipe priya! Lovely bread! Moist and perfect with a hot cup of tea. no kneading? now thats the kind of baking for me hehe, have a nice day !! Very tempting!!! Going to try right now!!! The bread looks great dear, I must try this. Wow! What a bread! It's very good and nice! Slurp! I love the combination of banana and cardamom. Nice bread and thanks for the entry. Love cardamon flavor..sure must have tasted great. tempting bread!! sure needs to be bookmarked! Hi I tried this today. I just substituted the flour with 2 cups white spelt and 11/2 cup wholegrain spelt. I put a pinch of cardamom. My kids liked this drizzled with a bit of honey. Thanks for this nice easy healthy recipe. Thanks for the lovely entries Priya..
Priya, I am trying this right now. Reached the stage where I have to refrigerate the dough for 1/2 an hour! Thanks for baking from my blog aand I'm glad you enjoyed this bread.